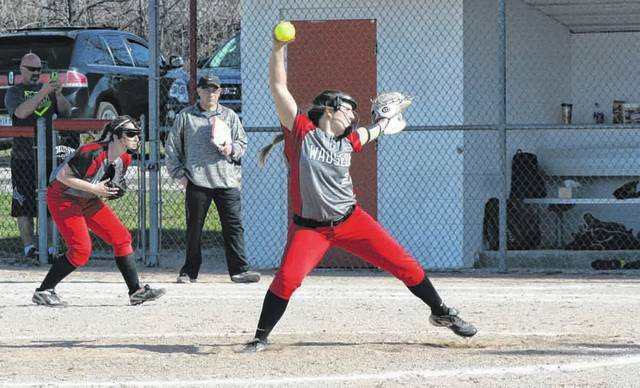 Juli Spadafore of Wauseon pitching in a game last season. She was tabbed as the NWOAL Player of the Year in 2018. Harlee Floss of Wauseon puts a ball in play during a game last season. She returns for the Indians after making second team All-NWOAL a season ago. 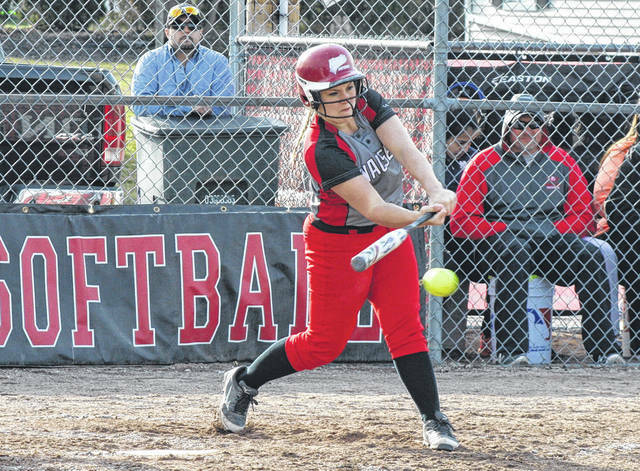 Wauseon returns multiple all-league performers, including a pair who made the first team, as they look to defend their Northwest Ohio Athletic League softball title in 2019. “(We are) expecting to peak come tournament time,” said new head coach Mark Schang on his expectations for the season. Schang replaces Jen Croninger, who resigned in September for reasons pertaining to her teaching career. Croninger headed up the Indians the last two seasons. The Indians posted a stellar 15-3 record in 2018, claiming a Division II sectional championship along the way. They were knocked out of tournament play following a 1-0 defeat at the hands of Clyde in a district semifinal. Returning for Wauseon are NWOAL Player of the Year Juli Spadafore and fellow first teamer Alisa Shelt. Also back are Christina Norman (honorable mention all-league), Harlee Floss (second team all-league), Chelsie Raabe (honorable mention all-league), Payton Albright and Jettie Burget. “Great returning letter winners. Good defense,” said coach Schang on his team’s strengths for the upcoming season. Newcomers looking to add depth to the squad are Autumn Pelok, Jayli Vasquez, Olivia Gigax, Harmony Torres and Alexis Haury. However, the Indians will have to replace three who made all-league a year ago. Gone are Ally Tefft who was first team all-league, and Maddy Martinez and Reagan Spadafore who were honorable mention all-league. Coach Schang says he has not found a weakness for his current team. Their goal is to claim a second straight NWOAL title, he says. Wauseon travels to Defiance to begin the season this Saturday at 1 p.m.